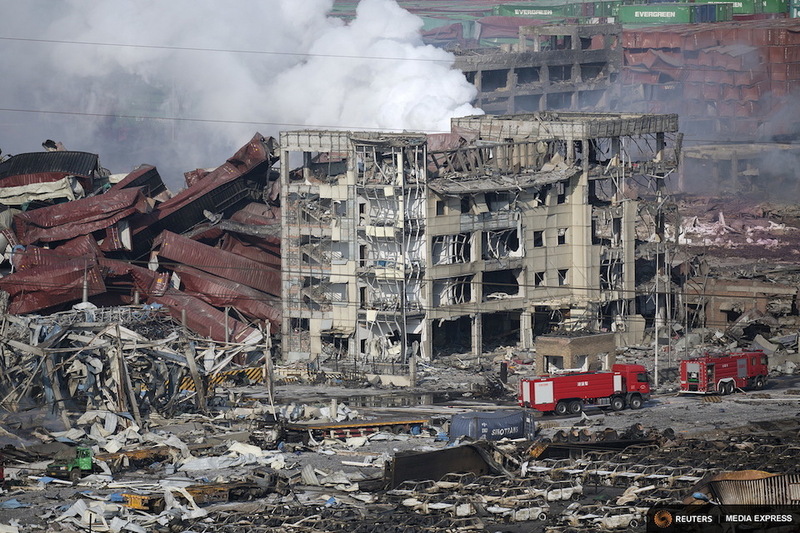 TIANJIN, China (Reuters) – Two huge explosions tore through an industrial area where toxic chemicals and gas were stored in the northeast Chinese port city of Tianjin, killing at least 50 people, including at least a dozen fire fighters, officials and state media said. The blasts the night of August 12, so large that they were seen by satellites in space, sent shockwaves through apartment blocks kilometres away in the port city of 15 million people. Internet videos showed fireballs shooting into the sky and the U.S. Geological Survey registered the blasts as seismic events. “Our building is shaking. Is this an atomic bomb?” said a frenzied voice inside. Among the injured were some employees of John Deere & Co <DE.N>, the U.S. farm and construction equipment maker based in Moline, Illinois. Company spokesman Ken Golden said several employees who were at home at the time of the blasts sustained serious injuries and that some are in critical condition.